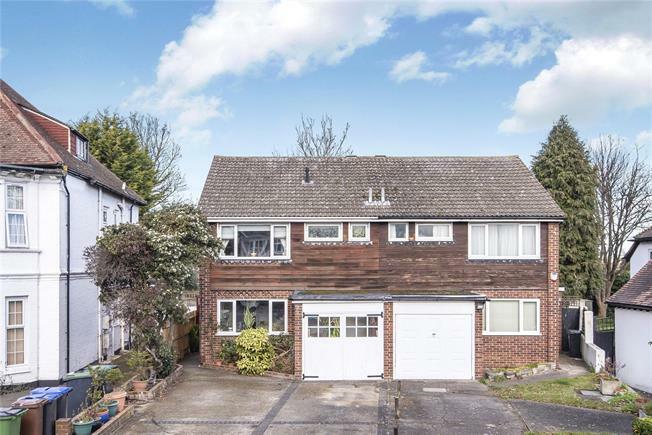 3 Bedroom Semi Detached House For Sale in Bromley for Guide Price £485,000. This three bedroom semi-detached family home is perfectly located for commuters and families looking for excellent local schooling. The property offers the potential and scope to modernise and improve to the tastes of any new owner and briefly comprises of; kitchen with access to a large utility area, spacious lounge with patio doors on to the rear garden and a downstairs shower room. Upstairs offers two double bedrooms, a single bedroom and a bathroom with separate WC. Additional benefits include a private rear garden with raised decked area and off-street parking for several cars. London Lane is convenient for those wanting the perfect balance of commuter convenience and family life. The property is situated just 0.4 miles from Sundridge Park station providing access in to London Bridge and Charing Cross and 1 mile from Bromley South station with its fast trains into London Victoria. The area is also convenient for connections to the M25/A20/M20. Bromley and the surrounding areas have a number of well-regarded schools including Breaside Preparatory School, Bullers Wood, Bromley High and Parish Primary School. Bromley town centre is also on your doorstep offering an array of shops, bars and restaurants.